A politician haunted by the ghost of his misdeeds… his ghost writer that is! 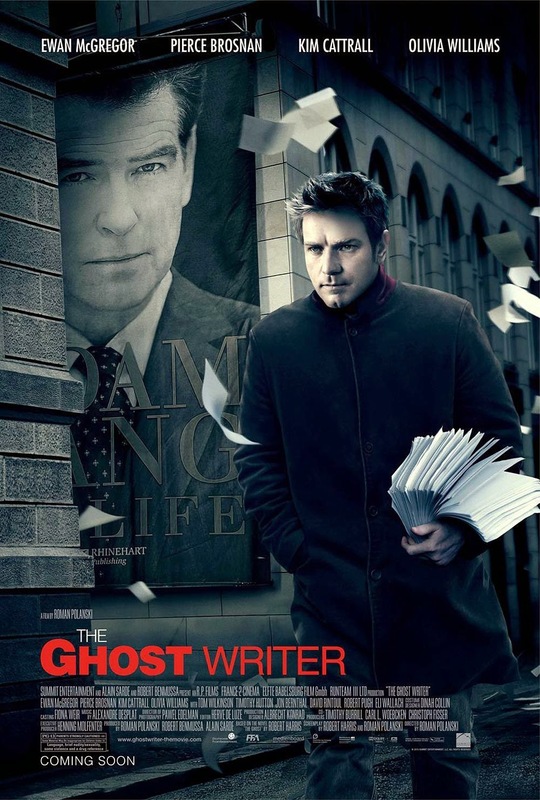 The titular Ghost Writer (Ewan McGregor) in the film is not granted a name. Ghosts tend to be paid to stay anonymous, you see and hiring a Ghost Writer to detail his past serves as a plain metaphor for the sins of British Prime Minister Adam Lang (Piece Brosnan) coming back to haunt him. It’s a clever device in a movie that is often very clever. The film is smart enough to hint at certain plot developments, where dealing with them head on could lead into melodramatic overkill. We hear sobs off screen… we know who is crying and why but touches like these put us in the Ghost’s shoes and keeps adding to the motif that there is much more going on than people realize. After meeting Lang, his wife Ruth (Olivia Williams) and his assistant (Kim Cattrall), the news comes in that Lang is accused of war crimes. The Ghost then delves deeper into personal and professional intrigue… The film drips in atmosphere and it has been much publicized how the rain in the film is almost a character. It rains in nearly every scene, and grey skies hover over the proceedings. The film also drips in dark humor, wit and is absolutely engrossing. We go on the ride with the Ghost, a perfect audience surrogate as he knows nothing about this Prime Minister just as we also know nothing. The film is primarily people sitting in rooms talking, but man do they keep your attention. In fact, some of the car chases pale in comparison to the tension in scenes just about people talking. Grade A acting and, again, atmosphere. There are a few “gaffs” that serve to streamline the story… electronics that don’t quite work like “real” electronics, but the real problem lies in some of the convenient plotting. How is it that the Ghost can find CIA records so clearly on the internet… if they were there, wouldn’t the British Courts also be looking for connections? If a writer who clearly claims not to be an “investigative reporter” can find things, shouldn't the police’s professional investigators should have known a little more and not be flabbergasted at certain uncovered truths. If the police knew a certain character was shady, shouldn’t they also have known that on Google search it says he did X for the CIA?! Also, for some reason, some of the language was clearly dubbed over to get a PG-13. I think the producers thought the film would have been a bigger hit and made it to more theaters, but its often disingenuous to the situation to use euphemisms, and it’s so blatantly dubbed, it’s kind of distracting. I strongly recommend this film for anyone looking for an adult thriller. The acting is grade A, and the direction and screenplay (with some gaffes) make the grade as well. This is a tension filled film “grown ups” won’t want to miss. I have gone the whole review without mentioning the Ghost who created this film, but I would like to comment on the irony that this Ghost also seeks safe haven in a foreign country like the Prime Minister. Alas, I do not want to comment any further (I love me some good irony so couldn't help but post) and will merely let the film speak for itself. And it speaks well for moviegoers.